As a top Los Angeles facial spa, Face of Jules performs effective and enriching high frequency facials that provide an array of long-lasting benefits. These particular skincare treatments are popular for improving wrinkles and other unsightly lines, darkened areas and puffiness under the eyes, acne, cellulite and oversized pores among other things. Once you try one of these amazing professional rejuvenating facials, you’ll want to come back for it time and again. The high frequency devices used for these facials have been tested and refined over time. While some of these machines differ in form, they all work essentially the same way and incorporate a high frequency electrode made specifically of glass. In order to efficiently improve all parts of the face and body, these electrodes are carefully designed in different size and shape configurations. The facial process itself is fairly simple. As the electrode is pressed against the desired area for treatment, the argon or neon gas contained within is energized by a small electrical current. Both types of gas have been shown to produce excellent results. The gas reacts to the electricity by glowing and buzzing rapidly within the electrode. This process creates enriched oxygen molecules that warm the skin tissue while also having an important anti-bacterial effect. Blood vessels and small areas of muscle directly underneath contract and repel various stored toxins. At the same time, the skin cells expand in volume and are filled with much needed nutrients. As a result, you’ll see substantial improvements in your skin as it becomes smoother, more vibrant and full of energy that it was lacking before. Your blood will better circulate through your body, and the restored cells will boost the production of highly-beneficial elastin and collagen. High frequency facials are so powerful that many clients see incredible results even after the initial treatment. The improvements to skin health and healing are often rapid, and the harmless, pain-free procedure works wonders on cold sores, acne skin lesions, waxing and even burns on the skin’s surface. Don’t delay in scheduling your professional high frequency facial at Face of Jules. Give us a call at (310) 770-8730, or fill out the contact form on this page. 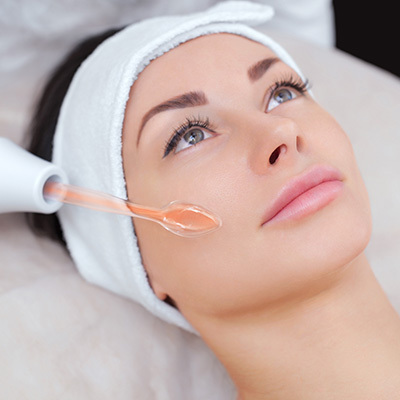 Treat yourself to a quality high frequency facial today. Call us now at (310) 770-8730 or schedule an appointment. Face of Jules is located in a private gated building with accessible parking. Please contact us upon your arrival so we can buzz you in. We are the last unit in the back on the left-hand side. Upon entering the building, you will see a sign for "Face of Jules Parking" where you are able to park. Facial Spa serving Los Angeles, Hollywood, Bel Air, Beverly Hills, Brentwood, Burbank, Culver City, Echo Park, Glendale, Huntington Beach, Laguna Beach, Los Feliz, Malibu, Manhattan Beach, Marina Del Rey, Newport Beach, North Hollywood, Ocean Park, Pacific Palisades, Playa Del Rey, Rancho Palos Verdes, Redondo Beach, Santa Monica, Silverlake, Studio City, Universal City, Venice, Venice Beach, West Hollywood, Westwood and surrounding areas.